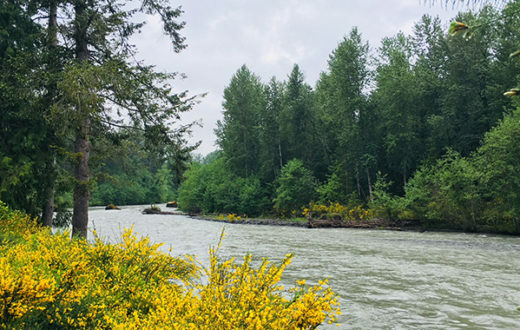 In this third installment of our series, we’ll take a closer look at Washington’s mighty Skagit River system and one of its valuable tributaries, Illabot Creek. This is a guest blog by Gregory Fitz. In October of 1968, President Lyndon B. Johnson signed the National Wild and Scenic Rivers Act into law. The legislation had been sponsored in Congress by Senator Frank Church of Idaho. The National Wild and Scenic Rivers System was conceived around the remarkable idea that some rivers were so valuable to the cultural and environmental legacy of a region that they should be preserved as natural, free-flowing waterways for the benefit and enjoyment of future generations. Since then, almost 13,000 miles of 208 rivers across the country have been protected. Six of those rivers are in Washington. To celebrate the 50th Anniversary of the Wild and Scenic Rivers Act, we are spending some time over the course the year telling the stories of Washington’s designated rivers: Illabot Creek, the Klickitat River, the Pratt River, the Skagit River system, the White Salmon River and the Middle Fork of the Snoqualmie River. Each is a unique part of Washington’s astounding network of rivers and each earned its designation in the national system through the hard work and foresight of advocates. The Skagit River is the largest river in Puget Sound and one of the biggest rivers in the entire state. It runs 150 miles long and drains a mountainous watershed that encompasses almost 1.7 million acres of the North Cascade Range and coastal Washington. The tallest peaks in the basin are a pair of volcanoes, Mount Baker and Glacier Peak. 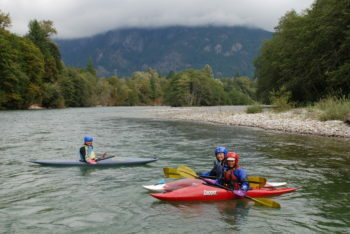 The Skagit River, along with its tributaries the Sauk, Suiattle and Cascade Rivers, were the first rivers in Washington to be included in the National Wild and Scenic River System. They are astounding, archetypical examples of northern rivers. The Skagit begins when it first flows off Allison Pass in the Canadian Cascade Mountains of British Columbia. It is joined by three major tributaries – Snass Creek, the Sumallo River and the Klesilkwa River – before it crosses the U.S-Canadian border. Between the border and the town of Newhalem, Wash., the upper river is impounded by the Skagit River Hydroelectric Project. This project consists of three dams owned and operated by Seattle City Light and, as recently as 2012, produces nearly 90 percent of Seattle’s electricity. The section of the Skagit River protected by the National Wild and Scenic River System’s “free flowing” designation begins below the areas impounded by these three dams. The dams were built many years before the National Wild and Scenic River System was passed into law. The Gorge Dam is the lowest of the three dams in the project. It was originally built between 1921 and 1924. It was replaced by a taller version in 1961. Below the Gorge Dam the river often runs dry as the water is diverted into a tunnel. It re-emerges near the town of Newhalem. Diablo Dam, the middle of the three, was built between 1927 and 1930. The furthest upriver, the Ross Dam, was constructed in three stages. The first was completed in 1940 and the second and third were finished in 1953. All three dams are listed in the National Register of Historic Places. They span a forty-mile length of the upper river and they impound reservoirs that stretch back across the U.S.-Canadian border. They were built without fish ladders. While migratory fish passage is blocked, the flooded geography included a severe gorge that may have prevented large numbers of historic salmon and steelhead populations above the dam sites. This makes the habitat present in lower river tributaries all the more crucial to the Skagit’s fish populations. The Skagit’s largest tributary, and a substantial river in its own right, the Sauk River, joins it below the town of Rockport, WA. The Suiattle River joins the Sauk north of the town of Darrington. The Cascade River joins the Skagit at the town of Marblemount. The Sauk, Suiattle and Cascade rivers were all included in the original Skagit Wild and Scenic River System when it was designated in 1978. The Baker River, the Skagit’s second largest tributary, joins the Skagit near the town of Concrete, downstream a few miles from its confluence with the Cascade. The Baker River has been impounded by hydroelectric dams since 1925 and was not included in the Skagit’s Wild and Scenic designation, though it is home to a population of genetically distinct sockeye salmon. From there the Skagit flows west another forty miles toward Puget Sound. Not long before reaching saltwater, the huge river splits into a north and south fork, forming Fir Island in the process. The estuary joins Puget Sound at Skagit Bay, 60 miles north of Seattle. 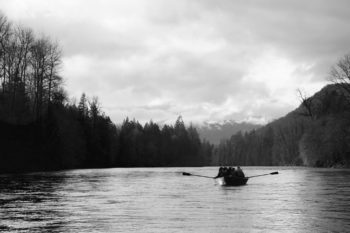 The Skagit River is named for the Skagit People, two distinct tribes of Lushootseed Native Americans who live in the region. Before European settlers arrived, the Upper Skagit People occupied territory along the Skagit, Baker and Sauk rivers. The Lower Skagit, often called the Whidbey Island Skagits, occupied land on Whidbey Island and near the mouth of the Skagit on the mainland. Today, the Skagit River basin remains home to the Upper Skagit, the Swinomish and Sauk-Suiattle Tribes. Illabot Creek is a small but significant tributary of the Skagit that joins the river upstream of Rockport. It isn’t one of the largest tributaries, but it still has miles of great salmon, steelhead, bull trout and bald eagle habitat. Where that habitat had been historically compromised, some of the crucial, and ongoing, habitat restoration work occurring in the basin is currently underway. It wasn’t included in the original Wild and Scenic designation for the Skagit System but was added thirty-five years later as its own designation. When the Wild and Scenic Rivers Act was originally passed in 1968, the US Forest Service (USFS) (among other agencies and advocacy groups) immediately begin to assemble lists of candidate rivers in Washington state that would meet the eligibility requirements for future designation, as was required by law. Washington is lucky to have a great number of waterways that meet this USFS criteria, but because of its astounding importance to the region, and outstandingly remarkable values (ORVs) including scenic, recreational, wildlife and fisheries, the Skagit River rose to the top of the list. 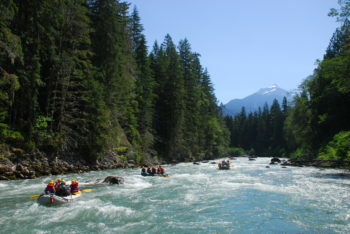 The Skagit would eventually be included in the National Wild and Scenic Rivers System (NWSRS) in November of 1978, a decade after the system was created. It was added as a portion of the National Parks and Recreation Act, a piece of legislation spearheaded by the California Representative Phillip Burton. At the time it was the largest parks bill in history and the Skagit system was the first of its kind to be included in the NWSRS. During this period that the Skagit River was being considered for designation, another dam and a nuclear power plant were being proposed in the region. The dam would have been the fourth dam in Seattle City Light’s upriver hydroelectric complex along the upper river near Copper Creek. The nuclear power plant was being proposed on Kiket Island, in Skagit Bay. The upstream and downstream boundaries of the Skagit’s main stem designated section was drawn to leave room for both of these power generation facilities, though due to changing economics and growing political opposition, neither was ever built. The Skagit River’s addition to the National Wild and Scenic River System also included the Sauk, Suiattle and Cascade Rivers. In total, almost 160 miles of rivers were protected. These important tributaries were designated as scenic rivers and were valued for the crucial fish habitat contained in their watersheds. It was a groundbreaking advancement in the legal protection of rivers to include the remaining, integral tributary habitat as part of one large, interconnected network. 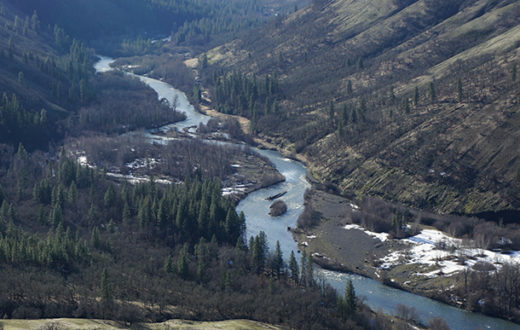 It was the first time in the history of the National Wild and Scenic River System that a river was considered as an entire system built around the needs of anadromous fish. 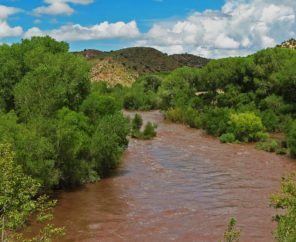 The designation recognized and celebrated the way healthy rivers function as a whole and protected much of the remaining, best habitat available. At the time, Illabot Creek wasn’t included as a part of the Skagit River System’s original Wild and Scenic designation. 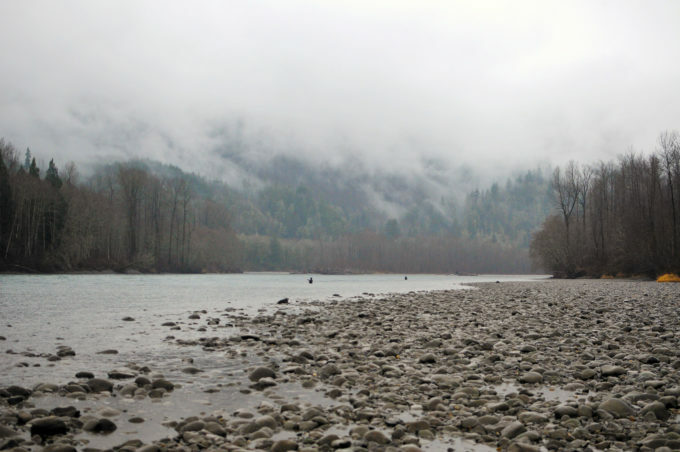 Advocates and ecologists always recognized its importance to the Skagit’s network of spawning habitat and, eventually, in December of 2014, a little over 14 miles of Illabot Creek was added to the National Wild and Scenic Rivers System. 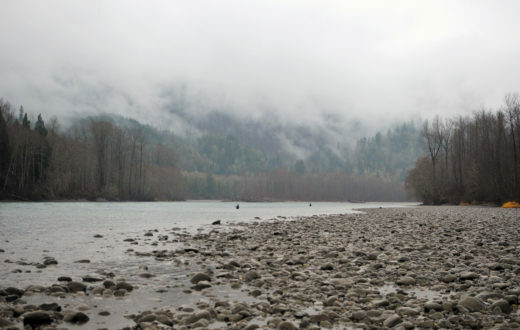 This was an important addition to the protected network of tributaries within the Skagit River system, but also evidence of the opportunity to continually expand and protect additional river miles within the National Wild and Scenic Rivers System. The law continues to be a fundamental, and evolving, conservation tool fifty years after the original legislation was passed. It is almost impossible to overestimate the importance of the Skagit River, and the incredible network of rivers in its comprehensive system, to the Puget Sound region of Washington. It is an iconic river of the Pacific Northwest. Its salmon and steelhead are legendary and sustained people in the region for millennia. Those communities were bedrock among the Coastal Salish people. The basin is a crucial corridor for wildlife migration through the Cascades and is home to one of the largest population of wintering Bald Eagles in the continental United States. The original Wild and Scenic designation celebrated the free-flowing characteristics and clean water quality of the designated watersheds. All of the rivers in the designation, with Illabot Creek being an exception, are important boating rivers. Whitewater rafting is especially popular on the Sauk and Suiattle Rivers. 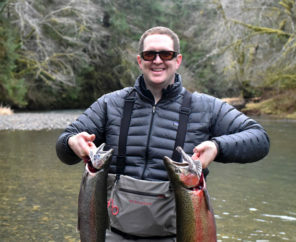 A niche fly-fishing technique involving two-handed rods and short, heavy lines was developed on the Sauk and Skagit by winter steelhead fisherman. 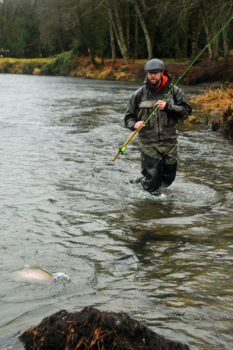 All around the world, fly fisherman now cast “Skagit Lines” in pursuit of fish on moving water. The fish remain fundamental to the watershed. The Skagit system is home to chinook, chum, coho, sockeye and pink salmon. It is synonymous with winter steelhead and its watershed contains one of the healthiest and important populations of bull trout in the Western U.S. But, like the rest of Puget Sound’s rivers, salmon and steelhead populations in the Skagit River are struggling compared to historic returns. The Wild and Scenic River designation protects important spawning and rearing habitat and provides a base for ongoing restoration projects to proceed. Important restoration work is being done on the lower Sauk River, and on the alluvial fan of Illabot Creek. The Skagit River System Cooperative, on behalf of the Swinomish Indian Tribal Community and Sauk-Suiattle Indian Tribe, along with the Upper Skagit Indian Tribe, Skagit Watershed Council, The Nature Conservancy and The Skagit Land Trust, among others, are working closely with the U.S. Forest Service and the region’s private landowners to foster and support on-going efforts to stabilize and protect the river system’s diminished salmon and steelhead populations. While pink and chum salmon in the Skagit system seem to be slipping during recent years, winter steelhead and Baker River sockeye salmon have been re-building their diminished numbers. The sockeye travel the Skagit until turning to swim up the Baker. Improved hydropower management and a fish trap-and-haul facility on that river has allowed more fish to reach their spawning habitat. After years and years of collapsing numbers, winter steelhead in the Skagit were listed as an Endangered Species in 2007. The river was closed to fishing soon after and hatchery steelhead were prevented from diluting the wild stock by lawsuits. From a low of approximately 2000 winter steelhead, populations have rebounded to an estimated average of 6000- 8800 steelhead a year. For the first time in a decade, a short catch-and-release winter steelhead season was allowed in the Spring of 2018. The Skagit River System, with its miles and miles of protected tributaries, remains an ideal place for the essential work of conserving the best remaining available fish and wildlife habitat and the crucial ecosystem functions provided by wild, flowing waterways. It is a beloved river, the lifeblood of the North Puget Sound region since time immemorial, and a perfect example of the priorities and values celebrated by the National Wild and Scenic Rivers System. Gregory Fitz is a writer, conservationist and fly fisherman based in Seattle. In our final post, we’ll be profiling the Middle Fork Snoqualmie and Pratt Rivers, two more of the six Wild and Scenic designated rivers in Washington. In celebration of the 50th Anniversary of the Wild and Scenic Rivers Act, we have teamed up with a number of partners and outdoor gear companies to collect 5,000 wild-river stories and to protect 5,000 more miles of such rivers nationwide. Share your story and learn more.